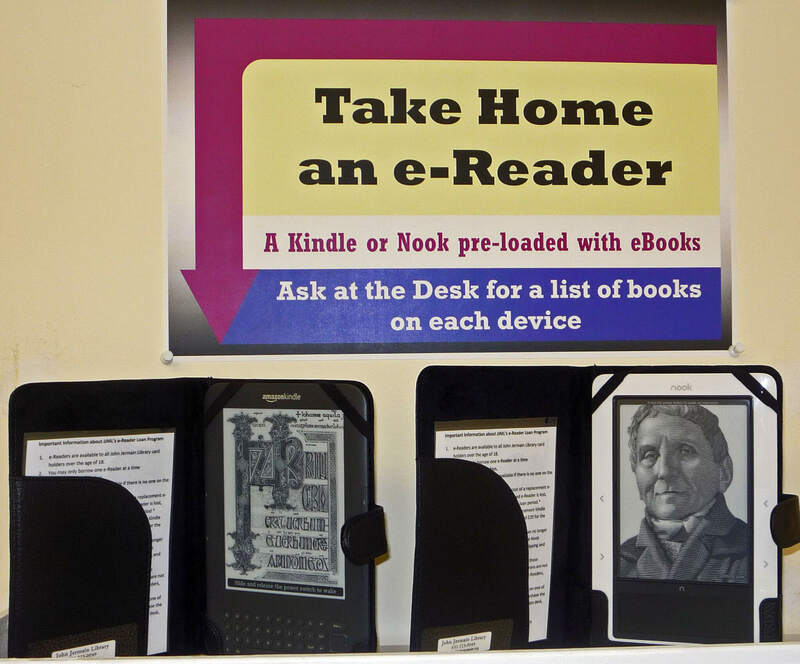 A Kindle and a Nook are now available for loan to JJML cardholders. If you’ve wanted to try an e-Reader such as the Kindle from Amazon.com or Barnes & Noble’s Nook, but weren’t ready to buy one before testing the waters, you can now borrow one from JJML. We now have a Kindle and a Nook, each loaded with about 20 e-books available for patrons to borrow. The Kindle has an assortment of contemporary fiction as well as a few classic novels, while the Nook is loaded with 15 non-fiction titles and a few classic novels as well. The e-Readers are available to any John Jermain cardholder 18 years of age or older. The loan period is 14 days…the same as for a print book. After that, one 5-day renewal is available if there are no holds on the reader. A list of the books available on each device is available at the front desk. Or, you can search our online catalog for “Kindle” or “Nook” to see the titles installed on each. Do not install anything on the device. These e-Readers are available only for reading the books that are installed on them by the library. When you return the e-Reader, do NOT put it in the bookdrop. These must be returned at the circulation desk. If you would like to read a book not yet installed on one of our e-Readers, please request that the library purchase the book. These requests can be made at the circulation desk, or by e-mail to info@johnjermain.org. And, of course, for those who already own an e-Reader, JJML’s Live-brary download service continues to provide a wide assortment of e-books that can be borrowed for reading on your own device.